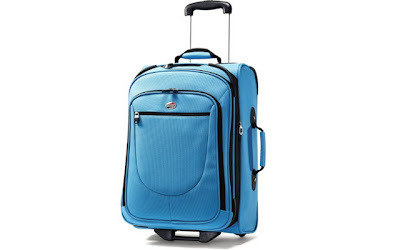 66% off the American Tourister Luggage Splash 21" Upright Suitcase - Just $47.76 Shipped! The American Tourister Luggage Splash 21" Upright Suitcase (in Turquoise) is currently selling for just $47.76 on Amazon.com! You will be saving 66% off the listed price of $140.00 with this luggage deal. Also on sale in Black for $47.97 and in Solar Rose for $64.22. Additional top, side and bottom handles in American Tourister's splash 21" upright prove functional when lifting a packed suitcase.